Clicktale is a website analytics software that is designed to give you the best user behavior analysis. Since on site behavior is vital for any big or small website, Clicktale keeps you updated with the most latest happenings on your website. 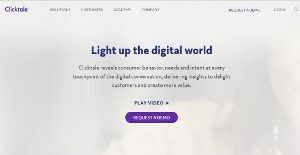 With more than 45 partners and firm grip in 94 countries of the world, Clicktale continues to grow as a business solution for almost all types and sizes of business. Up till now, it has optimized more than 20,000 websites across the globe providing digital analytics and marketing solutions. Clicktale has received some renowned awards one of which is the Adobe Marketing Cloud Innovation Partner of the Year. This is why some of the top companies in the world have shown their trust in this amazing business solution. The key to high ROI on digital marketing is to get the most relevant insights and information about the customers. Clicktale gives you exactly that. It’s a highly interactive software which ensures that your customers are being dealt with according to what they desire. Heatmaps, Analytic integrations, Session Replays, and smartphone apps are highly engaging and serve the purpose really well. Reporting is another key feature in this software. Conversion Analytics as well as drop reports have highly interactive features. These reports indicate accurate customer behavior allowing you to make necessary changes in your website. To give you the best results, Clicktale provides you testing services as well. Multivariate testing and A/B Testing allows you to run trial versions of your website so that your final product is a comprehensive one. You may belong to any industry, Clicktale has solutions for all. From the E-Commerce industry to Technical websites to Traveling websites, Clicktale has comprehensive optimization options for all the businesses. You have more control and 24 hour access to the reports analytics thanks to the Desktop version and the mobile apps. Whether it’s creating events or managing dashboards, Clicktale has a simple user interface that allows you to create events with just a few clicks. You don’t need to be a tech expert to run this software. The visual editors have dynamic features that make your job both easy and fun. If you are interested in Clicktale it could also be beneficial to examine other subcategories of Best Conversion Rate Optimization Software gathered in our database of SaaS software reviews. Each business has its own characteristics, and may call for a particular type of Conversion Rate Optimization Software solution that will be designed for their company size, type of customers and employees and even individual industry they cater to. It's not wise to count on getting an ideal software that is going to be suitable for each company no matter what their history is. It may be a good idea to read a few Clicktale reviews first and even then you should remember what the software is intended to do for your company and your employees. Do you require an easy and intuitive solution with only elementary features? Will you really use the advanced tools needed by pros and big enterprises? Are there any particular features that are especially beneficial for the industry you work in? If you ask yourself these questions it will be much easier to find a solid service that will match your budget. How Much Does Clicktale Cost? We realize that when you make a decision to buy Conversion Rate Optimization Software it’s important not only to see how experts evaluate it in their reviews, but also to find out if the real people and companies that buy it are actually satisfied with the product. That’s why we’ve created our behavior-based Customer Satisfaction Algorithm™ that gathers customer reviews, comments and Clicktale reviews across a wide range of social media sites. The data is then presented in an easy to digest form showing how many people had positive and negative experience with Clicktale. With that information at hand you should be equipped to make an informed buying decision that you won’t regret. What are Clicktale pricing details? What integrations are available for Clicktale? Pros: This is our main tool for runnin our business because it provides us with valuable information of analysis and we can easily improve our conversion rate on the site and to understand targets and our customers’ needs. We can keep track of records from those who fill in details and search over the questions. Cons: It’s not as intuitive as they claim to be. It takes time to tag up the site and to find some thing on the site. Pros: I like that through ClickTale we get thorough and accurate results on users’ traffic. We can track issues easily and work on the solution. There are great features for improving interaction with my team and to work together on fixing issues. We can keep track of everything and we know what’s going on in every moment. We get notifications when there is no or little activity on some pages and which pages get most attention. We’re able to re-evaluate page and to make attractive pages. Cons: The system analyzes the traffic only but there is no connection with social media analytics with web analytics. It would be great if they could improve the collaboration. Furthermore, when we make changes they are not visible to others and this means that others need to refresh the database in order to see changes. This is great tool because it allows you to get random samples or you can even set up “triggered” recorded sessions and to combine heat maps. If you need more information about Clicktale or you simply have a question let us know what you need and we’ll forward your request directly to the vendor.